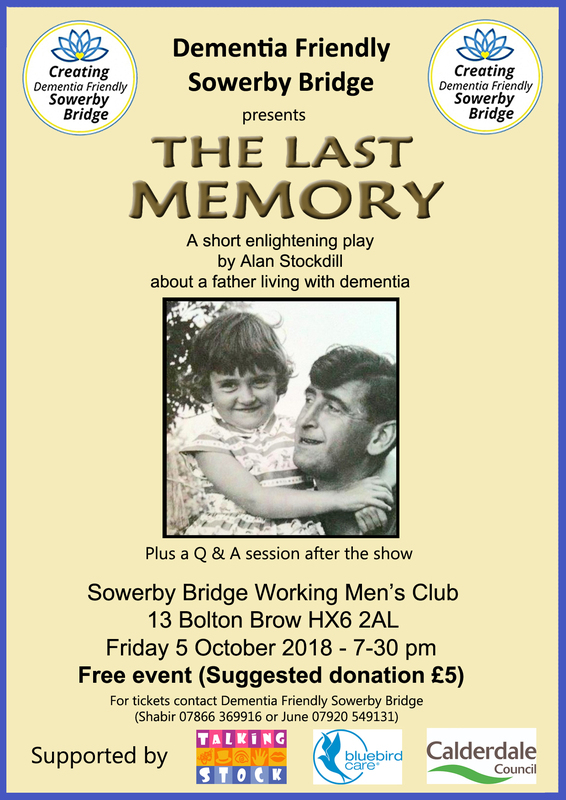 Following on from the successful launch of the Dementia Friendly Sowerby Bridge group with the Rock’n’Roll night on Saturday 15 September, the group is presenting a short play about a father with dementia and his daughter “The Last Memory”. The play by Alan Stockdill will be on Friday 5 October, 7:30pm at Sowerby Bridge Working Men’s Club, Bolton Brow HX6 2AL and will be followed by a short Question and Answer session. The Working Men’s Club is always open to non-members and all are welcome to this FREE event (although a donation of £5 would be welcome). For tickets contact Shabir on 07866 369916 or June on 07920 549131. ← Join us for our Big Macmillan Coffee Morning next Thursday, have a nibble & a natter!